This category includes posts about invasive animals, plants and microbes whether terrestrial or aquatic. What do you think of when you hear invasive species? 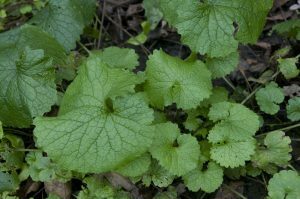 Some folks see in their minds garlic mustard and buckthorn choking their woods. Others conjure up images of lakes clogged with Eurasian milfoil. 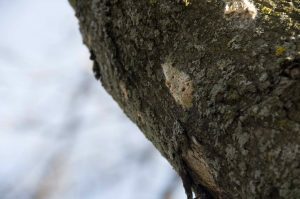 Still others may imagine gypsy moths or emerald ash borers attacking their trees. 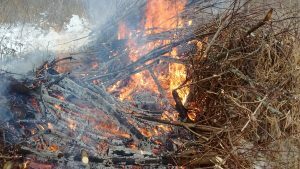 All these threats and more face landowners and those who spend time in the outdoors. As a landowner, invasive plants tend to present the most common issues for land management. 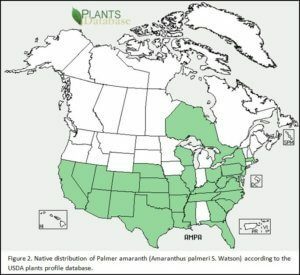 Some problems have been around for many years, like honeysuckle while others like Callery pear (Pyrus calleryana), Palmer amaranth (Amaranthus palmeri) and Lesser calandine (Ranunculus ficaria) are just beginning to show up on the landscape. Some folks are really deep into controlling invasive species. 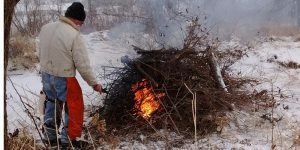 Each year the Wisconsin Invasive Species Council recognizes individuals and groups that make significant contributions to finding and getting rid of these problems. The Invader Crusader Awards honor professionals, volunteers and organizations that have made a difference across our state. Find out who is making a difference. To learn more about invasive species in Wisconsin and what you can do to protect your land, keep up regularly with our blog posts, make the Conservation Digest website for conservation management information and check out this article in the Prioritizing Invasive Plants in the current issue of the WDNR Natural Heritage niche magazine. 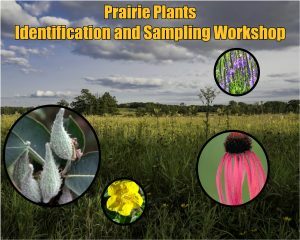 Healthy land includes plenty of diversity of both plants and wildlife. Invasive species crowd out native animals and plants; making for property that is both boring and much more susceptible to erosion. Invasive aquatic plants and animals pollute our lakes and streams and reduce habitat for fish. The best strategy for dealing with invasive species to prevent them from getting a foothold in the first place. Find out what you can do by logging joining a Taking Action webinar on Aril 21st at noon, sponsored by the Wisconsin First Detection Network. Learn about GLEDN, a great website and mobile phone app that lets anybody report invasive species throughout the Great Lakes, including Wisconsin. 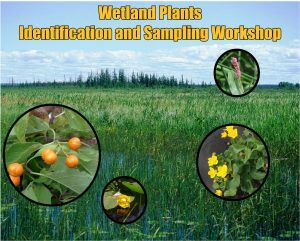 In addition to learning how to use the GLEDN app to report invasive species, we’ll learn about statewide Phragmites efforts from Jason Granberg (DNR) and purple loosestrife efforts in Washington County from Bradley Steckart (Washington Co. Land & Water Conservation Div.). 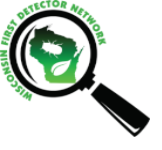 The Wisconsin First Detection Network is made up of landowners, land managers, scientists, consultants and volunteers who work to protect Wisconsin from new invasive animals, plants and diseases that can take over our land, lakes and streams. 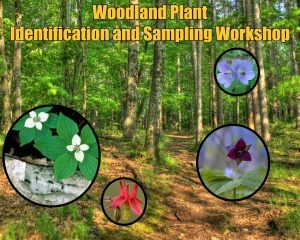 For more information about WFDN and this, the third in a four part webinar series this spring, contact Ann Pearce at the UW Extension. There are only a couple weeks left until gypsy moth caterpillars emerge from their egg masses to start eating their way through your trees. You can stack the deck in your favor by taking action now. 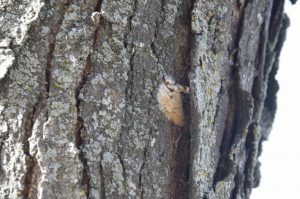 Start by learning to identify gypsy moth egg masses. They are typically 1-2 inches long, often appearing like a light tan teardrop shape. Remove the egg masses before the caterpillars crawl out in mid-April. Wear gloves when removing the egg masses as the small hairs in the egg masses can cause a skin rash. You can scape the egg masses into a jar and microwave them for two minutes. Another way to kill the eggs is to cover the egg masses in the jar with soapy water and leave them covered for two days. There is an insecticidal spray called Golden Pest Spray Oil, by Stoller Enterprises, Inc. (800-777-2486) that works by coating the eggs and suffocating the larval embryo inside. The active ingredient is soybean oil which is coupled with adjutants that allow the soybean oil to penetrate the hairy egg masses. Thoroughly soak each egg mass to ensure adequate coverage. 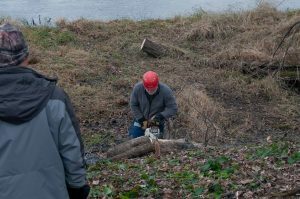 Southern Wisconsin Trout Unlimited volunteer cuts up boxelder as part of Sugar River work day last December. 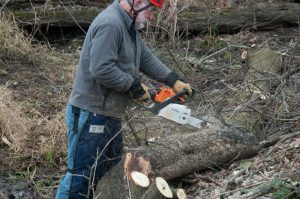 If you have been waiting for the right time to cut wood invasive trees, shrubs and vines; now is the time. 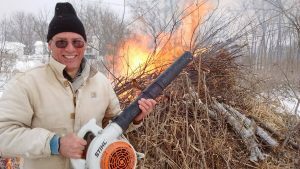 Snow is off the ground so it is easy to find and cut buckthorn, honey suckle and oriental bittersweet. 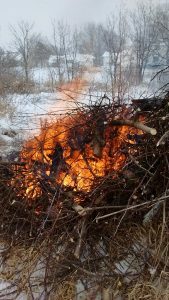 Stack the cut branches into a tight brush pile. I like to point the branches all in the same direction to get a tighter pack. Try pushing the pile down and even climbing on it to crush the branches. I even use my chainsaw to slice through the pile to compact it even more. 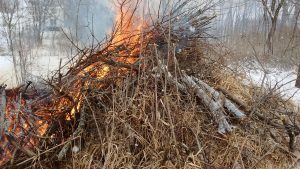 A dense brush pile will light easier and burn hotter because the wood is packed closer together, making it easier to get the fuel to its ignition temperature. Remember to cut close to the ground and immediately treat stumps with herbicide (e.g., Garlon 4 or Roundup). Read and follow label direction for the correct dilution. 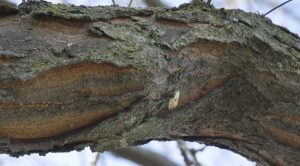 For those larger trees like boxelder and bigger buckthorn, you only need to treat the outside sap ring because the inner heartwood is not living and will not transport herbicide. Time is running out, so don’t delay. Once the buds begin to swell and break the sap will be running from he roots up into the leaves. 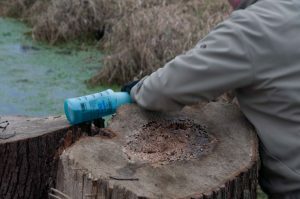 When that happens, the tree will not only stop pulling the herbicide down into the roots, but it may actively push the herbicide back out of the stump. Once the sap starts running, wait several months until the leaves have fully opened. At that point the shrub or tree will again start pulling nutrients down into the roots and along with those nutrients your herbicide. 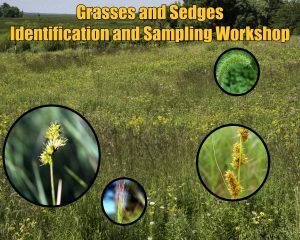 The University of Wisconsin Extension Weed Sciences program has released a new video about invasive species in Wisconsin. It tells what they are, why they are a problem, how they spread and what you can do about them. Whether you are a youngster or simply young at heart, this video will get you up to speed on a serious problem for natural areas throughout our state.